But back to today. Lain is calling today 'Wicked Wednesday', and we had to create a LO with NO PHOTOS. Not sure where I was going to go with this. Well, I spent some time on Club CK this morning, and found my inspiration in 2 challenges. I used the May Sketch it Out sketch by Ashley. 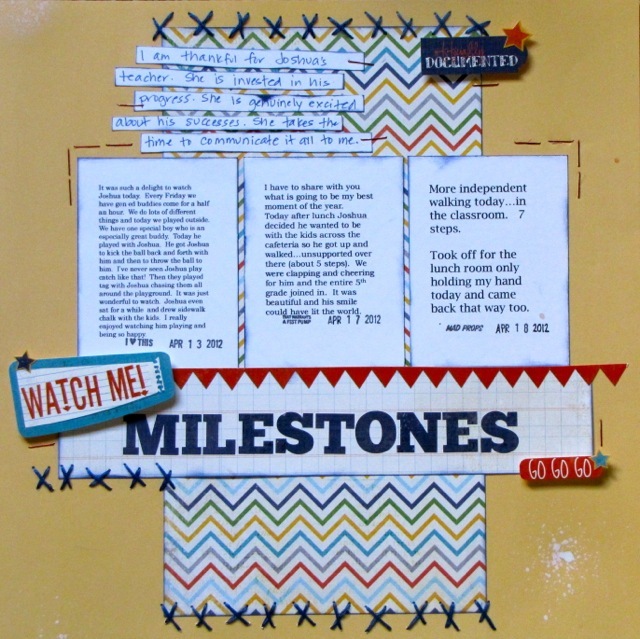 Once I had my ideas down, I found that the May/June Issue Challenge #1, use staples. This is not how I thought I would be using the sketch, but it really gave me a way to save these emails from my son's teacher. I copied and formatted them into a word doc then printed them on white CS. The background CS is SEI and the rest of the PP and embellies are EP A Boy's Life. 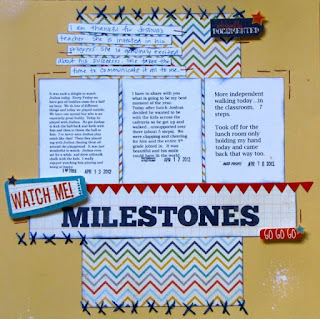 I used the Making Memories staples as photo corners around my printed emails, then also added them on the journaling strips and near the small clusters. I added a touch of Mister Huey white mist at the edge of 3 corners. They felt naked to me. I thought this particular stitch kept the LO fun and youthful, because the words are all about a little boy. I'm thinking of going this to his teacher as an end of year gift. Let me know what you think! One last thing I need to mention! You should really check out Thinking*Through*Design all this week. Big changes are going on over there and I wouldn't want you to miss out on the excitement! I love your layout, Devra. What a great way to capture your son's achievements and to save them. This will be great to look back on and remember. Love, Love, Love! !